Happy Thanksgiving everyone! The cotton fields are in full bloom right now, and they are beautiful. However, if you would like to see them you have to hurry, because the machines have started picking up the cotton. I started an 11" x 14" painting (planning to work on it for several days). Unfortunately, I was not able to complete the painting, because I did not realize how quickly the cotton plant would change. In just a couple of days what used to be a green bud, had turned into a big bowl of cotton. However, while working on my 11"x14" in the morning light, I was able to complete the 2 smaller paintings (see above) in the afternoons. I also worked on another small painting, trying to capture an entire field of cotton (and not just the individual flowers). However, as I started that painting, the machines swooped in and collected the cotton from right under my nose. While painting the cotton, a native-american man approached me and struck a conversation. From our conversation, I could gather that he had spent the majority of his life in prison. He was very appreciative and respectful of my work, but said that he lacked the patience to paint himself. It was a very memorable conversation, and I cherish those experiences. A gentleman and his wife stopped by to see me paint. They were so kind to email me some photographs of myself painting. I included those in the gallery above. Thanks Matt. Pretty soon early mornings will get really really cold and unpleasant for painting, so I am going to take advantage of this weather as much as I can. This morning, I was captivated by the delicate shape of the crescent moon. And here is a beautiful poem by Friedrich Hölderlin. I came across this poem while watching YouTube lectures on philosophy. In it, the poet says: "Once I lived like the gods, and more is not needed" - arguing that in life, quality trumps quantity. Regardless of how much you agree, it is beautifully written. playing, my heart may more willingly die. right cannot repose in the nether world. Be welcome then, stillness of the shadows’ world! My first attempt was a wipe-out. a bad start. For my second painting, the sun was already well behind the mountain, which gave me a somewhat larger of time to paint. The weather is perfect now (only mosquitoes at my spot). I did a full day of painting yesterday and I am quite happy. I love it when the weather is dynamic and the clouds are moving. I completed a couple of nocturnal paintings as well, but have not photographed them yet ... so stay tuned. Below is a picture with my phone from a painting that I did in the morning. In the afternoon, I enjoyed the company of this handsome guy. He must have been quite bored, because he wanted to attract my attention in all sorts of ways. He finally succeeded, when he started stealing my paint tubes and trying to chew on them or dig them into a hole. After I took that picture, I realized the he had quite a bit of cadmium yellow on his lips. So I grabbed his mouth and tried to wipe it as good as I could. That yellow maybe tasty, but its not good for you. The dog stayed with me the entire time that I was painting. When I completed my night painting at 8pm, he was still there. I felt bad driving away. I have some more paintings planned from that location, so I hope to see him again. Buying frames is expensive (especially for small paintings). It also takes time to receive your frames; time during which your paintings could be hanging on a wall. And finally, if you make your own frame, you can place just the exact color on the trim in order to complement the painting. So I decided to give this a try. To start off, I used a sample piece of frame that I wanted to make. This is simple L-shape floater frame. Most online frame-shops will ship you a free sample. Measuring off of that sample, I purchased my wood (8-quarters poplar, ~$25 for a 72"x8" piece) from woodworker's source. I am not an experienced woodworker, so the recommendation that I followed from the wood-shop was to make the L-shape by cutting out the wood on the table-saw, and not by gluing 2 strips together (to make it easier). In order to make accurate rip cuts, I purchased a rip-blade for my table saw ($30) and also used a feather-block to prop the wood in place while ripping. You can see the resulting moldings that I cut out of that piece of wood. Overall I am pretty happy how it turned out. This is an 8.5"x10.5" floater frame (for an 8"x10" painting). The corners are close to perfect. Any small imperfections, I believe I can remove by sanding a little or using just a little wood putty. I also made a slightly larger frame (11x14), which had more noticeable mis-alignments. Thus I believe that with my method, I will limit myself to making frames no larger than 11x14. This is because, the larger the frame the more precise the cut needs to be. My method seems to give in to error (maybe due to my miter sled) past a point. In the second part of this blog post, I will experiment with some paints/techniques for finishing the frame and I will share my findings. I was going around several Goodwill stores today in order to buy a small table, to re-purpose as a studio palette. I did find a table, but I also found this awesome antique coin-collection box that I bought for $6. The thing about this coin collection box is that it has grooves for fitting panels of exactly 14"x11", which happens to be a perfect panel size of outdoor painting (good thing I had my measuring tape with me, since I was measures tables). My Raymar panels fit perfectly inside this box (see below). Raymar sells plastic panel carriers for $30. The Raymar carriers hold 6 panels in 3 tracks (panels are back to back), while mine holds 20 panels in 10 tracks!!! I am now ready for an extended, plein-air painting trip. I am not sure what this place used to be. Maybe it used to be a gas station, or a car wash ... I don't know. I was captured by the strong shadow shapes, as well as by the little squares of color from the storage containers in the distance. While initially this place may look deserted - there was actually quite a lot of life around. There were a bunch of birds (I captures some of them). 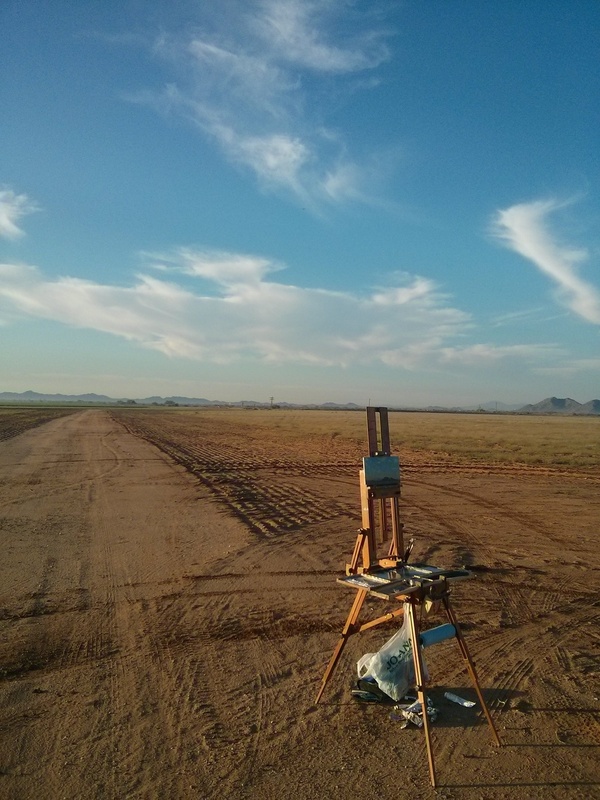 I also painted an airplane in the sky. The sitter had a very pale-white skin, which I thought was beautiful. In order to bring out the skin tone, I darkened the background slightly. I also simplified the background, which I think helps keep the interest on the spotted shirt. I normally use a combination of Terra Rosa, Transparent Oxide Red and Viridian for my skin tones (and white of course). However, under her powdery-white skin, there was a strong pinkish tint - which made me pull out the cadmium red. I quite enjoyed myself tonight. After chasing a moving light, and trying to capture the faces of talking, moving and grumbling people on the street - painting in the studio was relaxing :). This was a 3-hour pose at Scottsdale Artist School. Dale was quite the grumpy fellow. He was constantly fidgeting and mumbling how he was wasting his time. A couple of times I tried to ask him to stay still, but he was getting annoyed. He was actually pissed off regardless of what I did. So I stopped talking to him and just tried to capture whatever I could, before he would decide to leave. - Man, someone is going to shoot you for doing something like this! - Why? - I said. - Because, it does not look like anything. Barney is a war veteran. He was missing one ear, and was telling me that he was shot in his back (I don't know where in the back). He was hungry and thirsty too (I gave him a bottle of water and paid him a fair salary for his work). A man stopped by and told me that Barney was a good man, helping others and working to get people off the streets. Barney was sinking in thought, but then also flashing a big smile whenever people passed by and said "hi" to him. I painted him sad, but maybe another time I will capture his smile as well. I was facing south. Guy was back-lit and completely covered by the tree shadow. However, for a brief moment around 3pm the sun sneaked through the leaves and lit his book and his cap. I decided to include those warm patches of sun. I also included an element (in the upper left corner) which was not there, in order to complete the composition.